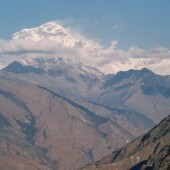 Dhaulagiri (8,167m) is the seventh highest peak in the world. 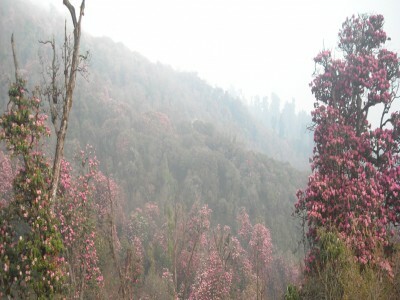 It is located in the western portion of Nepal. Dhaulagiri Circuit trek explores a wild and remote region of the Himalaya. 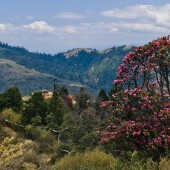 This is a trek for those adventure seekers looking for something off the beaten track. 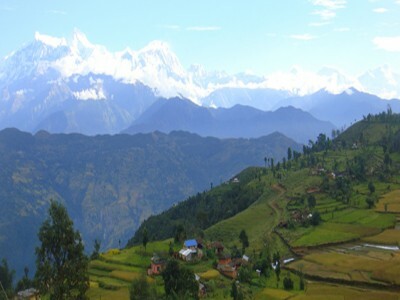 The treks start from Kathmandu with a 7-8 hours drive to the village of Dharbang. 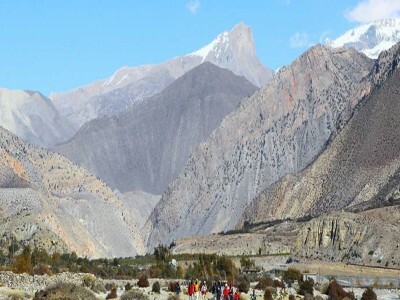 After departing from Dharbang you can enjoy excellent views of Dhaulagiri I, II, III, IV, and V. Then treks goes over the several high passes and descends until it comes to the village of Marpha. Trekking in Dhaulagiri offers some of the most spectacular mountain views of several 7000m peaks. 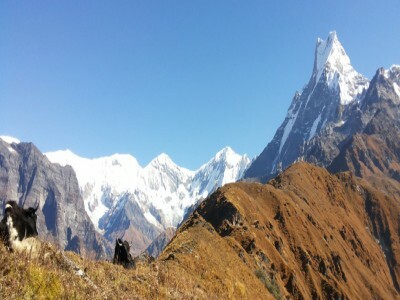 The trekking trail passes through several remote and small villages such as: Gurung, Chhetri, and Magar people. Here you will observe a unique culture and lifestyle that has been unchanged and intact for centuries. 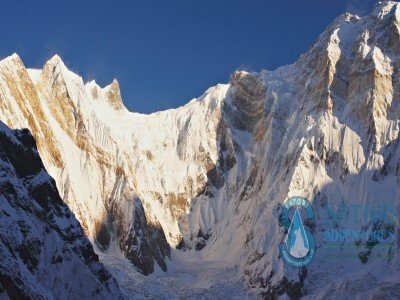 The trekking in this area is relatively considered challenging with several high altitude and strenuous sections that are remote. 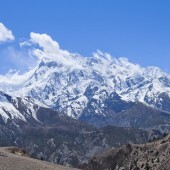 Mountaineering knowledge is required for this trek. 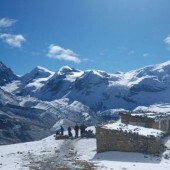 Dhaulagiri Circuit Trek is appropriate for trekkers who have enough time, enjoys remote mountain scenery and has knowledge of basic mountaineering skills. During this trek you will have delicious foods available to you. An experience guide and Porters will accompany you along the way. Day 01: Arrival in Kathmandu Airport and transfer to request category hotel accommodation in Kathmandu (1350M/4430ft). Day 02: Drive or fly from Kathmandu to Pokhara (915m/3002ft.) which takes about seven hours by bus and 25 minutes by flight. overnight at request category hotel accommodation in B&B plan. Day 03: Drive from Pokhara to Darbang (920m/3018ft) and then trek to Dharapani (1860m/6102ft, 06hrs)Tea house or Camping accommodation. Day 04: Trek from Dharapani(1860m/6102ft) to Muri (1720m/5643ft, 05hrs) Tea house or Camping accommodation. 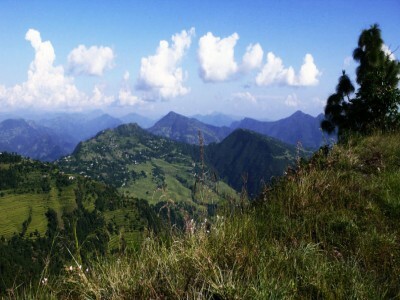 Day 05: Trek from Muri (1720m/5643ft )to Bagar(2080m/6824ft, 06hrs)Tea house or Camping accommodation. Day 06: Trek from Bagar (2080m/6824ft) to Doban (2520/8267ft, 05hrs) Tea house or Camping accommodation. Day 07: Trek from Doban (2520/8267ft) to Sallaghari (3115m/10220ft, 06hrs)Tea house or Camping accommodation. Day 08: Trek from Sallaghari (3115m/10220ft) to Italy Base Camp (3660m/12,008ft, 07hrs) Tea house or Camping accommodation. Day 09: Trek from Italy Base camp (3660m/12008ft) to Japanese Base camp (3890m/12762ft, 06hrs) Camping accommodation. 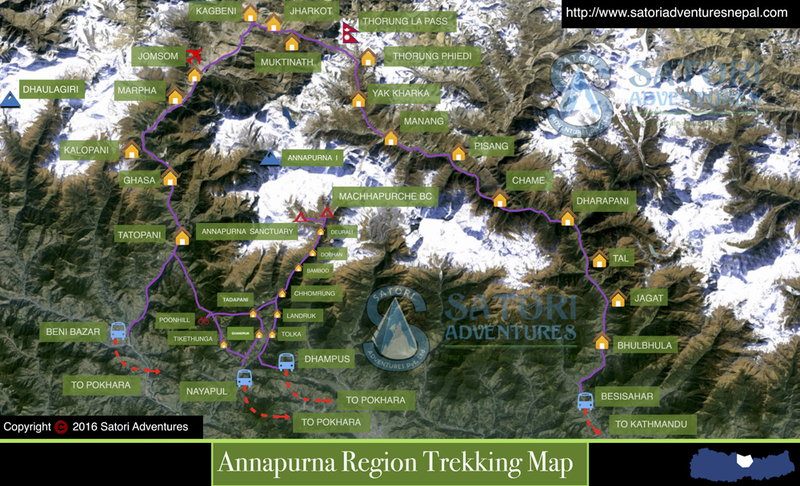 Day 10: Trek from Japanese Base camp (3890m/12762ft) to Dhaulagiri Base camp (4748m/15577ft, 07hrs) Camping accommodation. Day 11: Acclimatization or Exploration, Prepare or rest day for French pass (5360m/17585ft) Camping accommodation. Day 12: Trek from Dhaulagiri Base camp (4748m/15577ft) to French pass (5360/17585ft) to Tukuche base camp (Hidden Valley)(5,200m/17060ft, 05hrs) camping accommodation. Day 13: Trek from Tukuche base camp (5,200m/17060ft) to Yak kharka (4500/14764ft, 05hrs) Camping accommodation. Day 14: Trek from Yak kharka (4500m/14764ft) to Marpha(2670m/8760ft, 05hrs) then dive to Tatopani(1160/3805ft) Lodge accommodation. Day 16: Drive from Pokhara to Kathmandu by tourist bus that takes about seven hours also you can take a flight which takes about 25 minutes,overnight at Hotel.farewell dinner with culture program In the Evening. Day 17: Final departure, or Join alternative activities. The cost depends on request category hotel accommodation in KTM & PKR. 2 Nights request category hotel accommodations in Kathmandu on Bed and Breakfast basis. 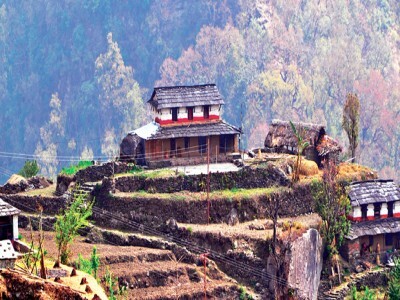 2 Nights request category hotel accommodations in Pokhara on Bed and Breakfast basis. Request mode of transportation from Kathmandu-Pokhara-Kathmandu (we have flight, tourist bus and Private vehicles) as per Itinerary for group and staff. Request mode of transportation from Tattopani - Pokhara (we have private jeep or public bus) transportation. 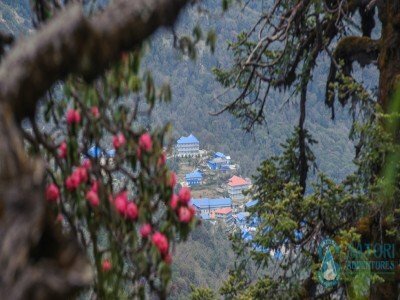 3 meals a day (Breakfasts, Lunch and Dinners with tea or coffee) along with available tea house/Lodge/ Guest house during trekking at twin sharing basis. 3 Meals a day breakfast (Breakfasts, Lunch and Dinners with tea or coffee) during the camping as per Itinerary. All request dinning tents, kitchen tents, members tents are available including chairs, kitchen cooking equipment, fuel, mattress etc(if client select camping mode of trekking). 2 trekking members will have 1, V25 North face 4 season tent available During the trekking and camping accommodation(if client select camping mode of trekking). 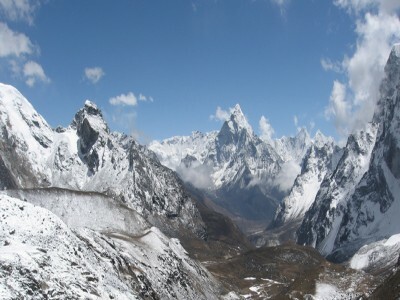 Experienced, Trained, Government Licensed, trekking/climbing guide as per group size. All request dinning tents, kitchen tents, members tents are available including chairs, kitchen cooking equipment, mattress etc. 200m fixed rope and 50 meters main rope in case of emergency. Any kind of Alcoholic, hot and cold drinks, hot shower. Any extra expenses arising out of various/unforeseen situations like natural calamities, landslides, political disturbances, strikes, changes in Government regulations..